It’s no secret that 3D Printing - Additive Manufacturing - is enabling a technological shift in how engineers envision new designs and overcome previous limitations. Look no further to last week, where Local Motors printed their Strati - a 2 seat electric car (drive unit, motors, etc not printed, rather from a Renault Twizy) and assembled nonprinted components in just 44 hours on the show floor at the International Manufacturing Trade Show in Chicago. It was their third print of a Strati, a process that they have been perfecting this spring and summer at NTRC of Oak Ridge National Lab. As you will come to learn, in typical Local Motors fashion, the Strati’s design started off in a worldwide contest where designers and engineers from all backgrounds submitted CAD models of their designs, with engineers at Local Motors and fan response determining the winner - and ultimately the final design. The Open source nature that launched Local Motors into the spot light with its first vehicle: the Rally Fighter and with subsequent products that they have released. Local Motor’s YouTube Channel further fulfills its open source nature with 1-3 and 5-7 minute videos detailing stages of oncoming projects as they happen, unlike any traditional automotive manufacturer. The result? Delivering products to consumer without the traditional waste of automotive manufacturing methods (which are vastly superior to those of even 2 decades ago with strong Kaizen programs) leading to a direct energy and environmental impact reduction. This is advanced manufacturing at the cutting edge of what is possible afforded - for the moment - at the corporate and research level. Just yesterday, GrabCad was purchased by one of the largest 3D Printing Companies in the world: Stratasys, who for the consumer market bought Makerbot last year. Grabcad is a free file collaboration repository that has over 1.5 million Engineers and over 500,000 CAD models ready to be downloaded by users and browsers of the site alike. I personally have used it to import directly into CAD assemblies for various projects and hold an active account. What GrabCad does for sustainability - now strengthened by its acquisition by Stratasys - is put 1000s of files collaboratively built by a global community for free access to print parts and models (not all models are for printing, but various software packages can easily convert models into printable files) with nothing more than an active internet connection. This helps to provide equity in access and help pave the way towards greater equity in printing, something that is still in the hands of upper middle class first-adopters and early mover corporations. As lesson plans are developed to integrate 3d printing into k-12 education across the United States, and eventually not just in prominent school districts but lower income ones as well, students of all backgrounds will gain experience in using 3D printing to express their creativity as well as understand the greater freedom that multiple types of printing can bring. They will also learn about what limitations exist in additive manufacturing - for now - which seen with initiatives like First Robotics, Lego Leagues, and others help drive towards a future career leveraging 3D printing experience. And this won’t be just for the STEM crowd that the United States misguidedly overemphasizes at the expense of liberal arts , , , but can also find its way in the arts, as wonderfully exhibited in this summer’s NYU Polytechnic’s Masters Course in Computational Fashion, and many other areas as well. These creative directions will help to broaden the appeal of 3D printing and its uses and make its way into more hands across economic and ethnic groups. With all of these parts being printed, what about the materials? Are we just wasting? Finally, in the consumer market, PLA and ABS are the 2 most prominent plastic choices for the majority of plastic printers. As it turns out, PLA is starch based and most definitely can be composted; while ABS - typically fossil fuel based - can be recycled. This fact of generation of material and the world’s growing plastic problem hasn’t been lost on companies and entrepreneurs in developing nations to develop printers that can used a recycled feedstock. A group called the Ethical Filament Foundation has started to build an ethical filament production standard sourced from waste picker derived plastic recycling, much like other sustainable / ethical certifications. You can follow them @EthicalFilament. With a project started last year between 3DSystems (Stratasys’s main competitor for largest 3D printing company), Coca-Cola, and will.i.am, the Ekocycle Cube 3D printer (based on 3DSystem’s Cubify Cube) showcases filament cartridges that contain 25% recycled PET content typically found in plastic drink bottles that Coca-Cola among other companies sell. While not on sale yet, will.i.am has already donated 2500 printers to First Robotics teams, further cementing a larger equity of 3d printing ability to kids across the United States to learn, create, and think creatively. A quick scan of the filament cartridges that you can buy for 3DSystems related Cubify Cube highlights the biobased PLA color choices students and adults alike can use to print detailed models in their favorite colors. Tying it in with accessible software, and nearly anyone can design and create models, parts, and products with a simple $1000 home printer. As the heading suggests, in the coming weeks, I will show you an upcoming Indiegogo campaign that looks to raise funds for a 3D printer (both a Cubify Cube and hopefully a Makerbot Replicator 2) in a rural Appalachia in the Copper Basin in SE Tennessee. The campaign will help to serve a larger purpose to 1) develop skills in a disruptive technology in an historically impoverished region to develop greater sense of well-being and prosperity without the boom-bust associated with mining and 2) develop a model for civic crowdfunding in a rural community. With this project, I will help to provide real-world feedback of how these concepts I’ve listed here work and give a status on where areas can improve. Ultimately, 3D printing is on a track towards reaching the “bottom of the pyramid” and also more of the middle than it currently is now, and with its application in a variety of fields, its promotion and inclusion of social equity and sustainability grows as the industry widens to the hands of more people. As these new ideas form and quickly become shaped by millions of new users, 3D printing technologies will continue to disrupt sources of innovation and add newcomers to a growing global audience. I know what you’re thinking. This is an urban mobility / sustainability focused blog, why is there a racing story here? Well, I did warn you, and I will owe you a story in the future about the benefits of racing in general to mobility technology, but take this a case study of racing’s technology transfer and public engagement at its finest. I am talking about Formula-E, the first ever all electric racing series with real drivers and very real electronic technology delivering 150 kW (202.5 hp) in an 888 kg (1958 lbs) single-seat package. While the power to weight ratio is low compared to other racing series, the advantage of electric motors is their maximum torque at zero motor speed, delivering instantaneous acceleration from a deadstop, propelling a formula-e car to 60 mph in 3 seconds, or half the time that you read this sentence. Big time names like Qualcomm , DHL , Michelin , Renault , and Tag Heuer have joined the development of the series while racing suppliers from the UK - McLaren and Williams provide the complex motor control electronics and battery technology to power the Dallara produced cars. Let’s take a look at the Metros that Formula E is hosting this inaugural season by income per capita and population density to get a sense for the areas where this technology will be seen first. While Carbon Emissions or Per Capita Energy Use proved difficult to obtain outside of the U.S., the below chart from the UNDP Human Development Report from '07 (via WithoutHotAir.Com) shows the general trend of increasing GDP and energy consumption country wide across the globe. As part of the larger story of Formula E, how can many of the growing economies that Formula E visits improve their standard of living without raising their power consumption? How about reducing the power consumption of current economic powerhouses without pushing lower income groups out of their metropolitan areas like previous generations of planned and unplanned gentrification? With 45 minute races and the battery capacity limited (for now) to deliver 25 minutes of electric charge, drivers will be swapping cars mid-race in a timed process, not unlike racing back in the day when many championships around the world still permitted car swapping in the event of a crash or mechanical issue. As you heard above, soon the series hopes to employ a wireless charging system not unlike the work being researched at ORNL to re-energize depleted batteries without a physical connection. This video below gives a good explanation of the progress Formula E has taken to get to this point with surely more in development as they look to open the car design up past this initial year to bring in new interests and live up to its development goals. As announced earlier this week, here in the States, Fox Sports 1 will be delivering live-coverage from Beijing at 3:30 am et / 12:30 am pt Saturday morning (3:30 pm local time) with a re-air during NFL coverage on Sunday the 14th at 1 pm et / 10 am pt. For practice and qualifying, you can follow @FIAFormulaE for practice and qualifying starting at 8:15 pm et Friday Night as well as the various Formula E teams competing. Stay tuned throughout the weekend with us @ClosedLoopUS for updates on the race weekend as we try to highlight the sustainable benefits this new series will bring. As always, I’d like to hear your thoughts on this story. Leave your thoughts below on the response you think Formula E will get at these large venues and some of the uses cities will have from the left behind charging stations following race weekends. What do you think? Although not in every state, bike share - also known as bike transit - is on the rise in the United States, as I try to show in the following maps and graphs with data from @beyonddc and earth-policy.org with Plotly. Sizes of bubbles are given by the number of bikes / stations respectively. With the explosion of bike transit mainly concentrated around the coasts and large urban areas, it begs the question of where is transit going and can bike transit continue its large growth? Exponential Growth of Bike Share: is it ending? As articles like this attest, bike share systems are a fundamental step towards larger bike acceptance in areas unlike Copenhagen and the Netherlands where biking is so deeply rooted in the everyday life, and electric bikes can help to bridge the gap of novice riders and experienced cyclists to flat and hilly areas alike. Meredyth already covered a lot of technological innovations to help reduce the costs and bring about larger adoption of electric bikes in the U.S.
As you heard in the video above, GM’s commitment to a new bike share system uncovers a larger ideology shift for the symbol of America’s 20th century. “Non-auto transportation” as some GM designers called it has become a larger part of their evaluation of their business especially in developing countries where crippling traffic brings mobility to a halt. As an automotive engineer myself, the greater question facing automotive transportation is not its disappearance but its restructuring into the larger mobility picture. With carsharing programs like Car2Go and Zipcar, ridesharing services like Uber and Lyft, and increasingly, growing bike share systems in dense urban areas pushing car ownership out from areas that really never could handle it to begin with, parking laws and rules will find the next axe to allow us to regain our open spaces in urban settings and with time and public funding turn dilapidated shopping malls into rejuvenated open centers that young and old alike will be attracted to - with or without a car. As the above videos show and a semi-successful beginning to a “cars pushed to the boundaries” city layout trail with Masdar in the UAE, bike share and its more equitably attractive cousin electric bike share have the real power of delivering the solution to the “last mile problem” in transit along with the aforementioned rise in ride sharing services. As cities look to either enter into bike share systems for the first time or to further expand their options to the public (and private institutions alike), further decreased costs in electric bikes and bike share technologies will make electric bike share systems more attractive especially in “vertically challenged” cities as bike share looks to spread inland from its coasts. Of course, as with electric vehicles, newer designs and implementations must remain cognizant of the sources that its components come from, as was studied in a 2009 report detailing electric bikes in mainland China with then Pb-based electrical components, as well as the energy they use to power them. We’ll take a look at that in the next coming weeks, but I want to hear your thoughts on where electric bike share systems should head next? Any personal experiences riding an electric bike share bike? Three Wheeled Bikes A Novelty or a New Direction? 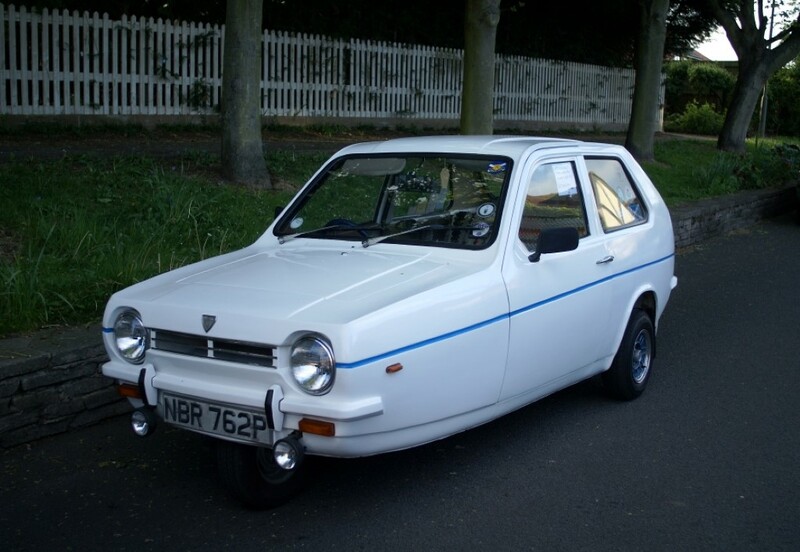 While three wheel cars - or “bikes” as they are legally defined - are nothing new, see the Reliant Robin below that Jeremy Clarkson hilariously rolled in Top Gear, recent headlines show that 3 Wheeled Vehicles could be on a way for a comeback as safety regulations and fuel economy constraints outprice new commuters and performance vehicles. As the above Reliant showed; however, a single wheel in the front can lead to some interesting stability issues with weight cantilevered on either side. With the exception of “trikes” or 3 wheeled motorcycles that you or I would consider a motorcycle, these new (and those still surviving) 3 wheel vehicles use a much more stable configuration of two wheels in front with one in the back. Tied with a small engine and a small footprint, the vehicles prove to be agile and nimble and can return great fuel economy. To that end, in the United States, 3 wheeled vehicles are considered motorcycles, which brings about an interesting result of that definition. Unless designated as a bus lane only, no state in the U.S. with an HOV system has exercised its ability to preclude motorcycles from the lanes, citing the grand safety benefit for conventional motorcycles to ride in the HOV lanes. For autocycles and three wheeled vehicles, as it stands within these 24 states, they are eligible to ride in the HOV lane without any passengers, which could prove to be a large selling point for three wheeled vehicles. With recent shifts in more motorcycles on the road to combat high gas prices and to take advantage of the commuter lanes   , 3 wheeled vehicles could a be more attractive option to inexperienced riders and those concerned with riding during rush hour alike looking to save money. In 1975, 47 states required motorcycle helmets while riding; that number has now dropped to 19 and the District of Columbia. Overall, for the majority of drivers targeting a 3 wheeler (aged 21 and over) few states legally will require a helmet (or in the state of Delaware, helmets to be present but not worn (for any motorcycle/autocycle for some reason)), and that may change out of practicality if this small niche survives. Enough about the law, what are the options? Brought back to life 60 years after the last Morgan 3 Wheeler was built, the modern remake of the original Morgan 3 Wheeler is really all about performance, although its original model’s success hinged from avoiding UK’s car fees. As the Morgan’s history showed, all kinds of vehicles were produced during the design’s heyday between WWI and 1950. When Morgan (which had switched to producing four wheel vehicles after 1950) was re-introduced to the popularity of a modern Morgan done by the now U.S. importer Liberty Motors, it teamed with noted motorcycle engine manufacturer S&S to create the beast that you see here. With it’s $45,000 base price and minimal comforts, expect to see very few - if any - using this a “daily commuter”. [caption id=”attachment_144” align=”aligncenter” width=”700”] Polaris Slingshot [Source: Green Car Reports][/caption]Surprising bike fans and car enthusiasts alike, this summer Polaris released the $20,000 Slingshot as a performance “side by side” for the road using a mix of car parts and a motorcycle rear end to deliver sport bike like feel in a stable three wheeled package. Although its open cockpit will require helmets (as seen in their marketing [by no accident]), a $20K base price may not necessarily price itself out of being a commuting option for upper middle class buyers if they want to use this for recreation as well. While more expensive than Polaris's rival Bombardier's Can-Am Spyder's base price, the Slingshot proves competitive with the Spyder's more expensive options which can push into the $20Ks as well. While still a far away from becoming a large vehicle niche, this bubbling emergence (especially the popularity in the recreational vehicle market of the Can-Am Spyder) of three wheeled vehicles has the potential to alter (for some) mobility patterns and may allow for some commuters to move farther away with the promise of smooth rides into and out of work or small trips solo. With current regulations defined as 4 wheels for a car, 3 wheeled options could pave the way - mainly if Elio has some success - towards other city-focused cars, especially for ride-sharing services such as ZipCar or Car2Go if motorcycle license requirements go away for such “autocycles.” With reduced weight, less mechanical complexity, and to a certain extent a reduced crash structure requirement, these vehicles could help to reduce some of the fuel used by families in large metro areas while also forcing consumers to think about their vehicle choices and modes of transit more closely. Three wheeled vehicles won’t replace conventional automobiles or take a large share of the vehicle market but will rather lead to smarter decisions by urban planners, automotive engineers, and families alike to define best capabilities of cars / trucks and where alternatives like 3 wheeled vehicles or electric bikes are better options to cars or other forms of transit. Some of this has already started in the U.S. due to gas prices and the Recession pushing consumers into smaller cars slowly as the car sizes they leave grow bigger and more expensive. Ultimately, in some sense three wheeled vehicles are subject to becoming victims of their own success. Much like the original reason to buy a hybrid for the commuter lane [which in large metro areas first allowed anyone in a hybrid to drive the HOV lane solo, but quickly became overcrowded), if a lot of three wheeled vehicles populate the road, especially in the event of multiple accidents involved autocycles without care and design into car-level safety, it won’t take long for states and finally the federal government to classify these “autocycles” as automobiles. With the classification as an automobile, three wheeled vehicles will be subjected to the same rules and regulations that will nearly eliminate almost all of their benefits due to the increase costs and weight to meet safety and emissions standards. Until or if that happens, it will be interesting to see if Elio is able to attract new competitors to the market that it is creating (as an alternative to used cars) and how state legislatures respond to not only another automaker selling direct to consumer (foregoing dealers) but to one selling within a murky grey area that some states have yet to define. More than anything, how safety advocate organizations respond to the Elio could ultimately force the hand of state and federal regulators alike. Electric bikes gaining ground in the U.S. I encountered a truly strange bike last weekend. I was running on a local trail when I noticed what looked like a submarine on wheels making its way towards me. It was as if someone had taken a reclining bike, enclosed it in bright orange steel, and added an electric motor to it. The helmeted occupant of the mysterious contraption hummed past me, and raised an arm in casual greeting before peddling off into the sunset. It turns out that I had encountered a velomobile - an enclosed, human-powered vehicle that offers greater speed and protection from the elements than traditional bicycles. As I expected, velomobiles are derived from recumbent bicycles, and can be purely human-powered or electric-assisted. Velomobiles aren’t stereotypical electric bikes, but my close encounter got me thinking about electric bicycles and their increasing presence in communities around the globe. [caption id=”attachment_116” align=”aligncenter” width=”385”] Velomobiles: aerodynamic, eye-catching, and environmentally-effective. Electric bikes first took hold in China as an efficient, inexpensive alternative to car ownership. China still leads the world in electric bike sales, with 32 million sold in 2013, but other countries are slowly but surely expanding their own electric bike fleets. Although sales of traditional bikes have remained stagnant or fallen in many European countries in the past eight years, electric bike sales are slowly but surely increasing. 250,000 electric bikes roam the roads in Switzerland, and electric bikes command around 11 percent of the market in Germany. Faster than traditional bikes and considerably less expensive than automobiles, electric bikes are also gaining ground in the United States. Electric bicycle startup companies are popping up in major U.S. cities, and some experts predict that the United States will take its place as a leader in electric bike sales in as few as twenty years. Contrary to stereotypes about clunky electric bikes common in previous decades, modern electric bikes are taking on all sorts of sleek, exciting forms. The winner of the 2014 Oregon Manifest Bike Design Project, Denny, features an onboard computer that automatically shifts gears based on peddling intensity. My favorite innovation in electric cycling is the Copenhagen Wheel. The Copenhagen Wheel is a high tech bike wheel that can replace any traditional bike wheel, and recaptures energy when braking or biking downhill. The Copenhagen Wheel’s flexible software development kit also provides software developers with the unique opportunity to develop new applications including navigation and wheel customization. Considering the increasingly sophisticated models that are being developed, it comes as no surprise that more and more people are turning to electric bikes as a mode of transportation. As in most systems, our nation's transportation system benefits from increased diversity. We need a transportation system made up of cars, mass transit and human-powered vehicles alike. While cars will continue to serve as the dominant mode of transportation for the foreseeable future, this new generation of electric bikes will hopefully help to narrow the gap.